A file archiving solution that lets you use any device as second tier storage. Featuring full support for DFS, replication, de-duplication, compression and unlike other archiving software it lets you use any NAS, SAN or other device as storage for your old unstructured files. At no point do we use a database to store files, pointers to files or file meta data. Its pure NTFS from start to finish. First released in 2002 ArchiverFS is now in use with a huge range of organisations worldwide, many of which are household names. It stands unique amongst archiving solutions for network file storage, SMB shares and Windows file servers. At no point do we use a database to store files, pointers to files or file meta data. Instead we just use normal files and folders, it's simple NTFS from start to finish. We don't try to be some kind of pseudo-document management system (see the How it Works page for an overview). We stick to what we are good at, and that is being a lightweight and highly efficient solution that tackles the problem of old and out of date unstructured files in network shares. Our unique approach makes ArchiverFS incredibly scalable and hugely cost effective. It provides users with the most cost effective way to archive old files possible, being able to migrate massive quantities of files over the network to second tier storage like a NAS or SAN while requiring only a small footprint on the host system. It enables you to migrate, store and then end of life old unstructured files from your storage system in a cost effective and controlled manner, thereby helping you tackle challenges like GDPR and Data Protection compliance. In addition to our unique approach for the storage of old files, only functionality that is already included natively in the Windows operating system is used. 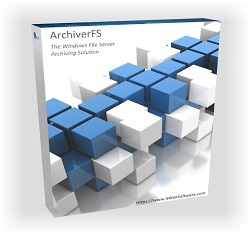 ArchiverFS doesn't require the installation of agents on to your workstations or servers, making deployment a breeze. Hardware agnostic: ArchiverFS lets you migrate old files from any UNC path to any UNC path over the network using a range of criteria including age, size and type. The target you use to move your old files too can be a NAS device, CIFS share, iSCSI volume, a VM or even cloud storage on Amazon AWS, Azure or Google Cloud. As long as the source and target volumes are formatted with NTFS and are shared to the network with SMB then content can be managed and migrated between them. No Proprietary Storage, it's NTFS from start to finish: At no point does our archiving solution try to store files (or even information about migrated files) in a database or proprietary storage mechanism. This is crucial as it provides massive scalability and makes ArchiverFS so incredibly efficient. The largest file system currently handled by our software so far stands at 3.4 PetaBytes of unstructured data, and this is done using a single Datacenter edition licence installed on a small VM with just 4 vCPUs and 6GB of RAM. 'Direct Access' is used to provide users instant access to content: When a user clicks on a link that was left behind in place of an archived file all of the IO goes straight from the users workstation directly to the file. There are no agents or other components in the way meaning that users don't have to sit around waiting for an item to be returned to the live system before they can access it. Any items that need to be returned back to the live system are returned by the daily maintenance job that runs out of hours. All of the information regarding where each file has been archived too is maintained in the file system itself through the use of directory structures and properties. Multiple link types: Several types of stubs are available to choose from which can be left behind in place of files when they are moved, including completely seamless links that behave exactly like the original item. Both folder and file level shortcuts which are more like traditional Windows shortcuts can also be used, and these offer the advantage of increased compatibility and can even be accessed by Apple Macs using an add-in like 'Win Shortcutter'. Unique 3 tier storage structure: Including Live, Archived and Graveyard stages. This unique feature enables ArchiverFS to create a true Hierarchical Storage Management system and migrate your old content for a fraction of the cost of a traditional file archiving solutions. Installation that is supported on all versions of Windows from 2008 Server on, including Windows Storage Server and Server 2019. Seamless compatibility with Windows compression, Windows Server de-duplication, Microsoft Search Server, DFS (Distributed File System), SAN based replication and SDS. Established product with a broad customer base. ArchiverFS is in use with a wide range of organisations from multi-billion dollar global companies to military contractors, law enforcement departments, government institutions, universities and everything in between in over 40 countries. Permissions and attributes that are 100% preserved at all times thanks to the use of pure NTFS for second line storage. Unique daily Maintenance Job that returns recently used files back to the live system and exactly replicates each items permissions from the live system to the second line storage. Full unicode support for most of the file system character sets in the world including English, Chinese, Arabic, Hindi and many more. Both Perpetual and subscription licences are available: Subscription licences are available for just over $1590 (approx £1100) for 2 TB of processing, and that is for each TB of files archived from the live system to second line storage. Unlike other solutions we don't charge based on the amount of old data that is sat idle in second line storage. Subscription pricing is based on the size of the files you move from live to archive storage in a given year, and not how much data you have sat in second line storage. After all it is your storage, why should you pay year on year just to have content sat on it? Deployment enables the migration of an unlimited number of old files from first line storage like a file server to any UNC path (NAS, SAN, On-premise, Cloud, etc.) whilst maintaining the NTFS permissions, properties and timestamps of your files in a seamless and efficient manner. You get lots of options and the flexibility to archive your content in whichever way suits you, and not some company who is trying to get you to sign up for a five or six figure sum year on year just to hold your old data for you! Why migrate your old files to second-tier storage? Slash restore times in the event of a disaster: What if you could just restore the items that people actually needed first in the event of a disaster, and worry about the rest later? We will enable you to completely separate the first and second tier storage, thus making this approach possible. What's more, with us you won't need to re-install any agents or client software to get back up and running, thus making recovery in the event of a disaster much faster. Free up space on your expensive first tier storage: The less data you try to store on your first tier storage the longer it will last. We have all been there at one time or another, you specify a new storage system by predicting the amount of space you'll need in a few years time, and then you add something from 20% to 100% just to be sure. A year down the line you find that the data has grown far faster than anyone expected and you have to start looking at buying extra spindles for your storage solution, or attaching extra shelves. 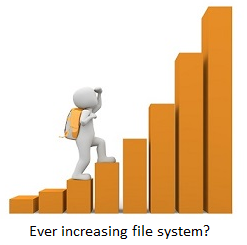 We will help you tame that growth thus extending the life of your file systems. Ensure regulatory compliance: In Europe we have the GDPR regulations, and most other countries have something similar. These regulations almost invariably require companies to consider how long they can retain data for. Meeting these requirements is extremely challenging for many companies, especially if they have a lot of unstructured data. We will enable you to specify how long you want to keep file system data for before it is disposed of. Cut the amount you spend on backups and other services: Old data doesn't change much. Yet every time you do a full backup of your systems you will be backing up old static content. With your old files migrated off to second line storage you can back them up less frequently, thereby saving on backup costs. Feel free to drop us an email if you have any questions about our file archiving solution, ArchiverFS. When you download a copy of ArchiverFS it comes with a free licence that lets you create up to 5 scheduled jobs. The only limitation is a limit of 100 files processed each time a job runs, which is perfect for smaller deployments or those looking to take it for a test drive.